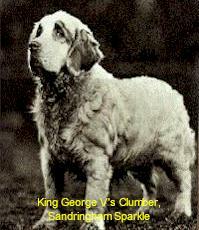 The Clumber Spaniel is the heaviest of the land spaniels. Often regarded as the "old man's gundog", the Clumber Spaniel is capable of vigorous, hard work in the field, particularly in areas of heavy cover. Energy, enthusiasm, staying power and the desire to please their master characterises the Clumber Spaniel in the field. Well balanced, strong, and heavily boned, the Clumber Spaniel is blessed with a thoughtful expression and bagsof personality. But there are, needless to say, pitfalls in owning this wonderful breed. 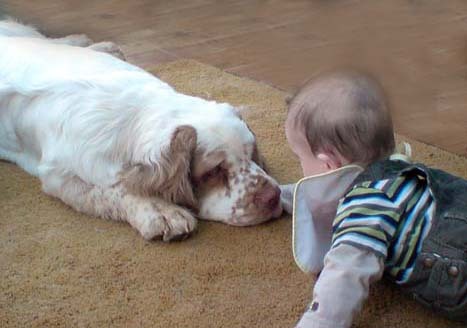 The Clumber Spaniel can be very determined and boisterous, especially as adolescents, and this requires firm, but gentle handling and rearing. 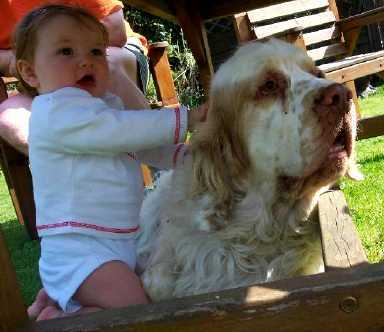 They are a very sociable dog and like company - as with so many breeds, left on their own, they can be prone to destructive tendencies (many Clumber Spaniel owners have found their furnishings "redesigned" by a bored Clumber Spaniel!). The breed does, of course, have its fair share of hereditary problems, including Entropian, Ectropian and Hip Displasia, as do many other breeds (indeed many have far worse, life threatening issues to deal with). 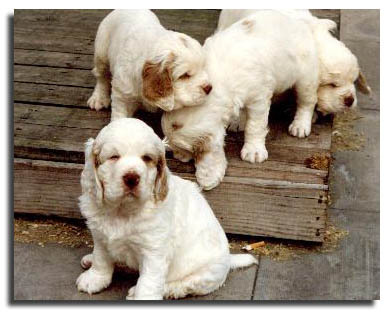 All of our Clumber Spaniel breeding stock have been tested for PDP1 and are certified clear. 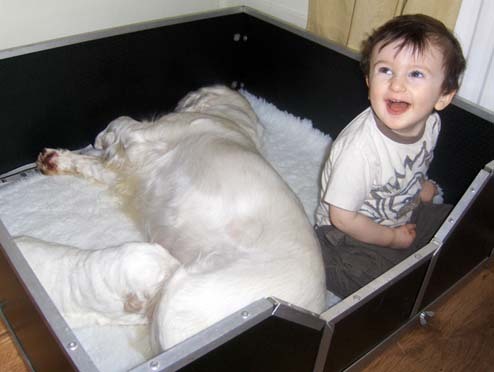 We have always found the breed to be good with children. Our family grew up with them and now Hannah and her husband David have the breed. To the left, you can see Doris, Maursett Melusine, with her two pups (one Clumber and one human - the latter being our grandson Sam). Sam, Hannah and David's son, was accepted as part of the Maursett Mob from being just a few hours old and all of our dogs adore him (as well as his younger brother Ben, older brother Dan and sister Beth). Our grandchildren all enjoy their time with them and we have never experienced any problems as Clumbers are a tolerant and sociable breed. On the right, Sh Ch Maursett Mindsapint enjoys some quality time with our granddaughter Ione. Naturally, some caution does need to be exercised, especially for those who may be unfamiliar with this heavyweight spaniel. 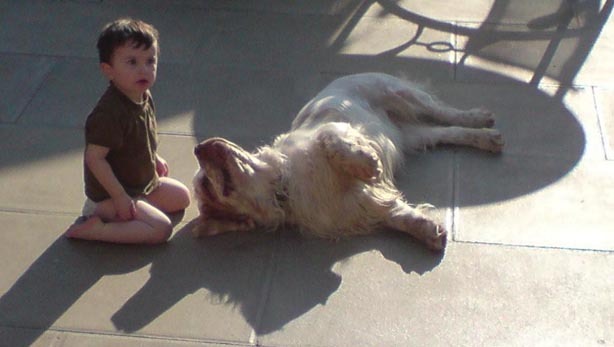 If you are going to acquire a Clumber Spaniel, listen carefully to the breeder about the breed and its problems. Above all else, the Clumber Spaniel is a loyal and dedicated member of the family. A more rewarding relationship would be difficult to imagine. We could not be without them. Two babies together - our grandson, Sam, with The Stig - both the same age and friends forever!